There’s been much done, and even more written about online influence and community. But it’s time to see who really has the biggest boots in town. Today, we’re glad to announce the first-ever competitive event in the large scale robotic influence of online social groups. 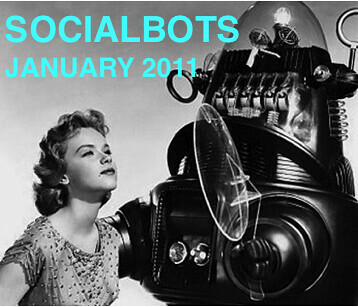 SOCIALBOTS 2011. Teams will program bots to control user accounts on Twitter in a brutal, two-week, all-out, no-holds-barred battle to influence an unsuspecting cluster of 500 online users to do their bidding. Points will be given for connections created by the bots and the social behaviors they are able to elicit among the targets. All code to be made open-source under the MIT license. It’s blood sport for internet social science/network analysis nerds. Winner to be rewarded $500, unending fame and glory, and THE SOCIALBOTS CUP. Registration fee is $25 per team, payable by check or PayPal. Teams should sign up BY JANUARY 8th by sending an e-mail with contact information to tim.hwang@webecologyproject.org. I came across this competition on the Doc Searls harvard weblog and I am looking forward to any updates during the competition and learning more about the winner. Any chance you will publish any type of statistics or information regarding the competition? I am very interested from more of an analytical stand point. Great idea! So, has it started? We want to meet the teams! Really interesting competition I wonder who won? After I studied a few of the blog posts on your site now, and I truly love your style of writing. I bookmarked it to my bookmark website list and will be checking back soon. Pls check out my site as well and let me know what you think. product or service as green when it's not is called greenwashing. robby the robot was a great character. This was great to follow! Any chance of a new battle any time soon? Really cool competition. I would love to know the results from last year and are you going to do it again this year?